What was old will be new again. And what is new will be harmonized with the old. 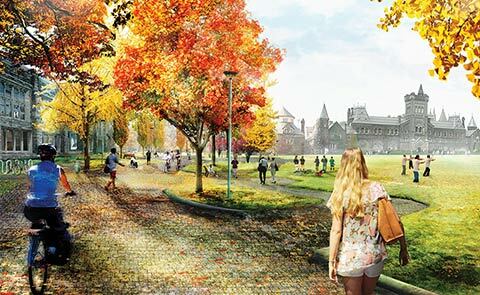 After months of study and public engagement, the Landscape of Landmark Quality competition has selected a consortium of KPMB Architects, Michael Van Valkenburgh Associates (MVVA) and Urban Strategies to restore, renew and beautify the central spaces of the University of Toronto’s historic St. George campus. 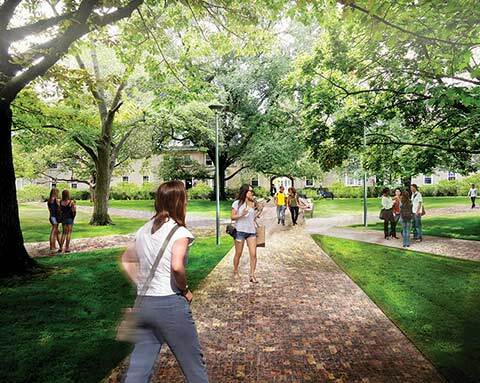 The winning proposal, which envisions a car-free necklace of paths around King’s College Circle, a stately column of oak trees along Tower Drive and granite surfaces in place of asphalt and concrete, is a point of departure, not a final blueprint. The eventual design will depend on what the development team learns through further public consultations. 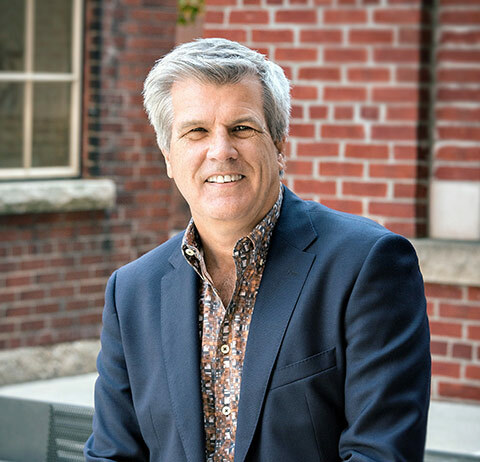 “We have been committed to soliciting feedback from the community and will consult much more extensively over the next several months,” Mabury says, noting that the university received more than 600 responses after the initial presentation of the four shortlisted proposals in Convocation Hall in September. “If there is one thing this process has taught us all, it is how deeply students, faculty, alumni and staff love the landscape of this university and how strongly they feel about its future. We have been guided by their passion. There was a lot of support for the winning team,” says Mabury. The schedule requires that team to submit a plan in September 2016 that includes design details, an outline of engineering needs and estimates of the duration and cost of the project. All of this will entail teamwork, both within the winning consortium and with members of the university community and U of T’s neighbours. Car parking does not disappear but goes underground. “We are required by city bylaw to maintain a certain number of spaces so neighbours don’t bear the brunt of 400 more cars on adjacent streets,” Mabury explains. KPMB/MVVA/Urban Strategies seeks to make a virtue of this necessity by proposing modern glass pavilions beside the J. Robert S. Prichard Alumni House and in front of the Medical Sciences Building that would provide access to the parking garage and bicycle parking. The Medical Sciences pavilion as represented in the architects’ preliminary drawings has a curved roof inspired by the shape of Convocation Hall and an indoor-outdoor café. 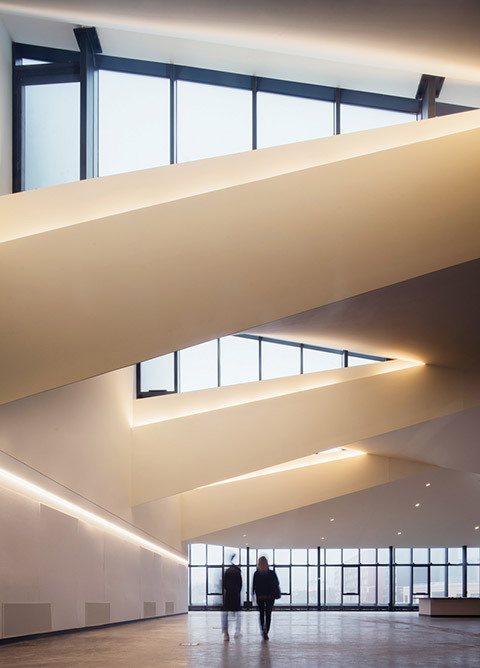 The familiar broad concrete staircase would be replaced by gently sloping, accessible paths and terraced seating. 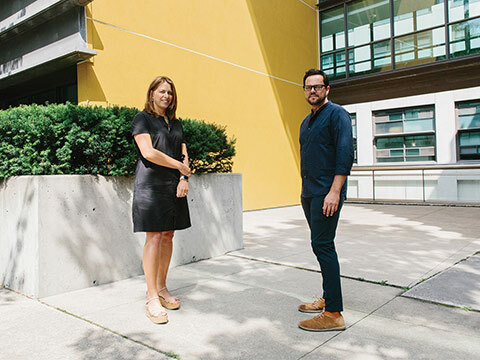 “This was a terrific opportunity to create a great ‘hang space’ for students and faculty,” says Shirley Blumberg (BArch 1976), a KPMB founding partner. The architects also propose to redesign nearby Convocation Plaza from the bottom up. In place of the nondescript asphalt surface (itself overlaid last August by a playful but temporary blue-dotted pattern) they suggest granite pavers of varying shades that connote the many diverse activities embraced by the front campus and the university. Stone has other practical virtues: Gradations in tone and texture provide cues to cyclists and pedestrians to interact safely, according to the brief from KPMB. Interlocking walkways around the circle encourage natural interaction with the famous green pasture at the centre. A related question is how to integrate and repurpose the Louis B. Stewart Observatory – a building that dates from the 1850s, but was moved to its present location in Hart House Circle in 1908. It currently houses the University of Toronto Students’ Union, which will be relocating to the new Student Commons on College Street in 2017. Another proposal with curb appeal was a winter recreational feature, such as a skating rink. Whether and how it could be implemented remains to be seen. Some design elements of the proposal will survive, others will be superseded. But the intention to move forward is fixed. “We didn’t pick the plan, we picked the team,” Ainslie says. “We want the team that has the skill and has a planning strategy that speaks to the diversity of our community and can sustain the life of a busy campus every day. Arthur Kaptainis is a senior writer with U of T Communications. Please ensure that the beautiful cobblestone walkways have smooth ride areas for wheelchairs. It is very hard for persons on wheelchairs to ride, vibrating over beautiful-looking cobblestones. Areas with wooden paths should be installed longitudinal to the path as opposed to transversal to the path because the wheelchairs can ride smoothly along the longitudinal boards. In the new High Line park in new York City they installed longitudinal walks which are a delightful new concept for wheelchairs. Take a look! Please ensure the handicapped needs are considered. Until the back campus is returned to "its famous green pasture" from the hideous and non-people friendly AstroTurf, I have little empathy with your plans for the front campus. It strikes me as hypocrisy. I have spent hours and hours a university library in one of the flanks of the vast interior spaces of the St. George campus. I also had the good fortune of visiting the Harvard campus in 2004 and St. George campus will be far more pleasing, as the spaces are indeed far larger in Toronto. At 84 I am not so sure whether I could see the rejuvenated St.George. In any case, I wish the best for my valued Alma Mater. If the title “Goodby to Cars!" is intended to be a joke, it is in very poor taste. I suspect the largest cost to the project is the creation of a underground garage for 500 cars. This is an invitation, not a goodbye. The real question here is why we are spending so much to create a car park in the centre of a large urban area that is very well served by mass transit. The municipal demand for more parking spaces is something that a progressive university, and one with a new focus on its relationships with the urban environment, should be fighting, not capitulating to. It is ironic that this article appears at the same time that the world is focused on the climate conference in Paris. A good start. Next step would be to convert St. George between Harbord St. and College St. to a pedestrian walkway. No thru traffic sounds great till night falls. Then see how a no-traffic community feels unsafe. Just ask Regent Park, which was a horror show until they reopened the streets to the overall grid. The plan to revitalize Kings College Circle and get rid of the cars sounds great. As A grad of both U of T and Harvard, I hope the excellence of the Harvard Yard work can be duplicated here. One suggestion: get rid of that soccer field in the central area. Why continue to scar this highly visible centerpiece with the wear and tear of soccer activity? Restore the lush greenery. Transfer the soccer playing to the regular athletic fields where it belongs. Since the 1950s, when I and my then-girlfriend (now wife) were U of T students, it has seemed that Convocation Plaza could - and hopefully now will – be much improved by the absence of cars. The proposed use of granite is a plus. It's a more pleasing, attractive and durable surface than asphalt or concrete. I earned my PhD at Princeton, and last visited in 2012. I can confirm the charm of the campus setting, with its Collegiate Gothic architecture, superb landscaping and absence of cars. Motor vehicle access to the campus is very limited, ensuring that it remains strikingly attractive and people-friendly. 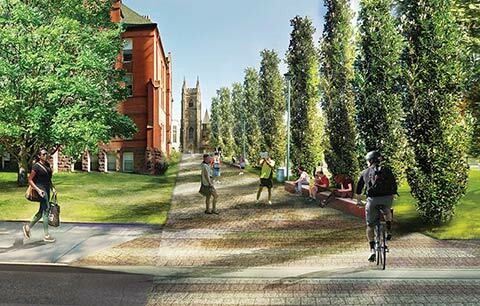 Kudos to the U of T Landmark Committee’s efforts to date. 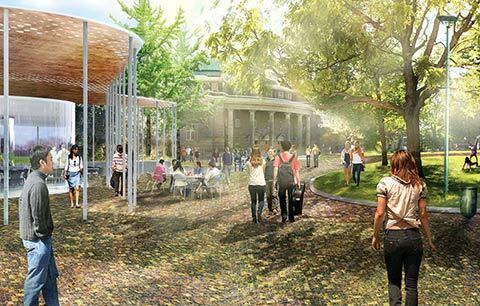 We look forward to seeing the proposed changes take place at U of T! I concur with Peter Hurley's comment above: particularly in light of President Gertler's recent statement that we bear responsibility for action on climate change. Encouraging more people to drive into the core of the city by providing yet more parking is retrogressive and wrongheaded. There has never been parking on King's College Circle for anything approaching the 500 cars to be accommodated in the underground garage. This is the University of Toronto, not an American university. Things move here at a snail's pace. Grand plans, but they're 20 years out! I like most of the vision - open spaces, back to pedestrian walkways and space for cyclists. In image number two, I see some type of covered, modern, out-of-place structure. Please don't put this there; it is out of keeping with the rest of the circle. If you have to put in a covered open space, then move it to the back of Simcoe Hall so access to the hall during convocation can still take place comfortably regardless of rain or sun. The St. George campus's historic architecture is something that other Toronto universities don't have. You should hold on to it. Take the opportunity to STAND OUT. Please don't mess this up with ill-suited modern structures. If you really must have a covered space consider something that is visually appropriate and is covered in greenery for nine months of the year (with some blossoming in the summer and fall). There are 307 spaces currently within the Landmark project area (this includes Tower Road, Hart House Circle, King’s College Circle, King’s College Road, Galbraith Road and Anatomy Drive), plus an additional 10 accessible which would be maintained. The intent is to replace the surface parking in a below-grade garage but to include spaces for electric vehicles and car-sharing within that count. The university’s requirement under city bylaws is to provide between 1,930 and 2,130 parking spots on the St. George campus. The university does not want to flood nearby areas with cars that are not able to find parking on campus. That said, the university encourages people to take alternate modes of transit to campus. For example, U of T offers discounted TTC passes to faculty and staff and car-sharing programs. The drawings look good, but I share Francisco Gracia's concern about an uneven surface for bicycles and wheelchairs -- and faculty dragging cases on wheels. All those could become very difficult if the surface is not perfectly even. Also, Rhiannon Davies has a point about the modern structure. The steps of the Medical Sciences Building are brutal, but they do rather blend into the background more than some sort of covering would. Moreover, it is worrisome that U of T will spend so much money on this while many classrooms in older buildings need simple repairs such as painting and replacement of damaged desks -- not to even mention needed technology such as projectors. Isn't this a bit of a luxury project?